The NORRA Mexican 1000 competition has become one of the most contested of the Baja Penninsula races, with stars like Parnelli Jones, James Garner and screen and race legend Steve McQueen participating in its history. Now it makes history again with the first EV to challenge the four-day General Tire Mexican 1000 rally. Joining the ranks of legendary vehicles like the Olds 442 Banshee will be the new SRI EV1 electric Baja racer. The car took its place in the technical inspection today and will hit the sands tomorrow with the other vehicles taking part in this year's General Tire Mexican 1000 rally. This is the first time in the rally's history that an all-electric car has participated. The EV1 is a full-scale, 100% battery powered electric car built to function much like a Class 1 unlimited open-wheel machine. Designed by Strategic Recovery Institute (SRI), SRD and EV West, the car outputs 535 horsepower and 750 lb-ft of torque through two nine-inch Netgain WarP motors controlled by an Evnetics Soliton 1 and turning through a Mendeola S4D sequential gearbox. Team SRI will race the EV1 buggy through the 1,200+ mile Mexican 1000 through all three Special Stages tomorrow, which begins in Mexicali adn runs through to Bahia De Los Angeles. From there, it will be limited by range, but plans to get into the final Secret Stage on Day 4 before the finish line at San Jose Del Cabo. 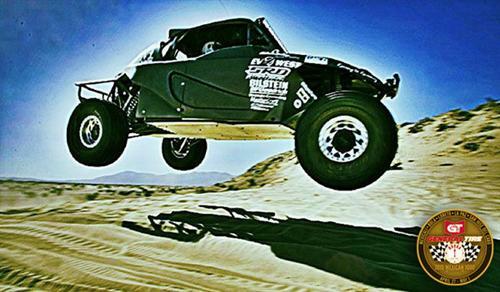 The Mexican 1000 is a unique on- and off-road event that isn't like the usual Baja endurance competitions. It is instead a multi-day schedule with stops and rest periods in which the EV1 can recharge and many of the on-road transit sections do not require the competing machine to be operating (it can be trailered and usually is). As it is, the 138 3.3v 180ah lithium batteries from China Aviation (in "hot swap" packs that can be traded out quickly), makes for 82kWh (this includes the small pack that powers on-board GPS and other requirements) - about the amount of power the average home uses in a week. The race team sees this as a proving opportunity and if the SRI EV1 does well, they will use the hot-swap setup and things learned from this race to configure the electric buggy to race in the full line of Baja races in the near future. "This is a monumental undertaking that has been 18 solid months in the making," explained Strategic Recovery Institute founder Jeffrey Smith. "Our entire team is excited about what we are stepping forward to do. We are confident that our upcoming Mexican 1000 capabilities demonstration will generate future battery sponsorship to allow the ability to 'hot swap' multiple battery packs andcomplete entire races in the near future."